Working with genetically engineered mice and the genomes of thousands of people with schizophrenia, researchers at Johns Hopkins say they now better understand how both nature and nurture can affect one's risks for schizophrenia and abnormal brain development in general. The researchers reported in the March 2 issue of Cell that defects in a schizophrenia-risk genes and environmental stress right after birth together can lead to abnormal brain development and raise the likelihood of developing schizophrenia by nearly one and half times. "Our study suggests that if people have a single genetic risk factor alone or a traumatic environment in very early childhood alone, they may not develop mental disorders like schizophrenia," says Guo-li Ming, M.D., Ph.D., professor of neurology and member of the Institute for Cell Engineering at the Johns Hopkins University School of Medicine. "But the findings also suggest that someone who carries the genetic risk factor and experiences certain kinds of stress early in life may be more likely to develop the disease." Pinpointing the cause or causes of schizophrenia has been notoriously difficult, owing to the likely interplay of multiple genes and environmental triggers, Ming says. 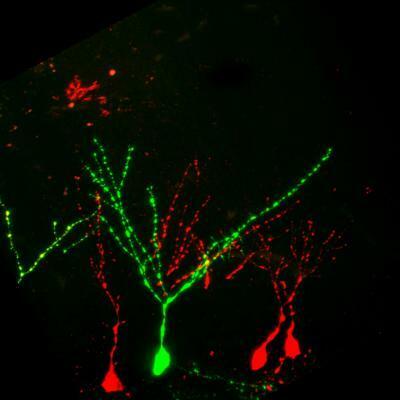 Searching for clues at the molecular level, the Johns Hopkins team focused on the interaction of two factors long implicated in the disease: Disrupted-in-Schizophrenia 1 (DISC1) protein, which is important for brain development, and GABA, a brain chemical needed for normal brain function. The green neurons have reduced DISC1 protein. Red neurons have less effective GABA. To find how these factors impact brain development and disease susceptibility, the researchers first engineered mice to have reduced levels of DISC1 protein in one type of neuron in the hippocampus, a region of the brain involved in learning, memory and mood regulation. Through a microscope, they saw that newborn mouse brain cells with reduced levels of DISC1 protein had similar sized and shaped neurons as those from mice with normal levels of DISC1 protein. To change the function of the chemical messenger GABA, the researchers engineered the same neurons in mice to have more effective GABA. Those brain cells looked much different than normal neurons, with longer appendages or projections. Newborn mice engineered with both the more effective GABA and reduced levels of DISC1 showed the longest projections, suggesting, Ming said, that defects in both DISC1 and GABA together could change the physiology of developing neurons for the worse. Meanwhile, other researchers at University of Calgary and at the National Institute of Physiological Sciences in Japan had shown in newborn mice that changes in environment and routine stress can impede GABA from working properly during development. In the next set of experiments, the investigators paired reducing DISC1 levels and stress in mice to see if it could also lead to developmental defects. To stress the mice, the team separated newborns from their mothers for three hours a day for ten days, then examined neurons from the stressed newborns and saw no differences in their size, shape and organization compared with unstressed mice. But when they similarly stressed newborn mice with reduced DISC1 levels, the neurons they saw were larger, more disorganized and had more projections than the unstressed mouse neurons. The projections, in fact, went to the wrong places in the brain. Next, to see if their results in mice correlated to suspected human schizophrenia risk factors, the researchers compared the genetic sequences of 2,961 schizophrenia patients and healthy people from Scotland, Germany and the United States. Specifically, they determined if specific variations of DNA letters found in two genes, DISC1 and a gene for another protein, NKCC1, which controls the effect of GABA, were more likely to be found in schizophrenia patients than in healthy individuals. They paired 36 DNA "letter" changes in DISC1 and two DNA letter variations in NKCC1 — one DNA letter change per gene — in all possible combinations. Results showed that if a person's genome contained one specific combination of single DNA letter changes, then that person is 1.4 times more likely than people without these DNA changes to develop schizophrenia. Having these single DNA letter changes in either one of these genes alone did not increase risk. "Now that we have identified the precise genetic risks, we can rationally search for drugs that correct these defects," says Hongjun Song, Ph.D., co-author, professor of neurology and director of the Stem Cell Program at the Institute for Cell Engineering.